RACHEL MADDOW: If you look at the last election cycle, of the top ten people donating money in that election, seven of them were giving to Republicans, those were all corporate interests and Right-wing PACs and stuff. Seven of the ten were all Right-wing, and the only three that weren't were unions. So, if Republicans can get rid of the unions, particularly these public sector unions, they can run the table in every election from here on out. SHEPARD SMITH: Can you explain Wisconsin?...Have you looked at the list of the top ten donors to political campaigns, the top ten highest? Seven of those ten donate to Republicans. The other three that remain of those top ten, they all donate to Democrats and they’re all unions. Bust the unions, and it’s over. 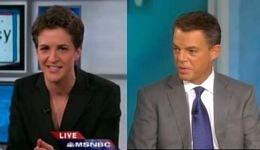 Hmm, is Shep a Rachel Maddow fan? She cites some stats and draws a conclusion from them, and the next day Shep cites the same stats using similar language--and draws the same conclusion. Now if Rachel Maddow’s stats were general public knowledge this could be a coincidence. But after spotting Noel Sheppard’s analysis of her comments, we followed his lead and went to Open Secrets to see for ourselves. As Mr Sheppard noted the watchdog website contradicts Maddow’s claims. Neither the top ten overall donors nor the top ten individual donors lists shows seven of them leaning Republican. In fact, in both cases there were more Democrat-leaning donors in the top ten than Republicans! So now we have not just similar language leading to the same conclusion, but also identical stats that may have been made up by Rachel Maddow...and repeated by Shep Smith the next day! A Shep-Maddow connection? We report, you decide. UPDATE: An alert reader points us to what may be the source for Rachel Maddow’s (and Shep’s) comments. This Open Secrets table lists the top expenditures by special interest groups, including 527s. Sure enough, seven of the top ten are characterized as ‘conservative’. But the list does not characterize them as (R) or (D), because the dollar amounts shown as spent by these groups didn’t go to candidates. They went to such things as issue advocacy ads, often artfully worded to avoid specifically endorsing a candidate. Hence the #1 name on this list, the Chamber of Commerce, actually spent $0 for or against candidates. Unfortunately for Ms Maddow (and Mr Smith), this list simply does not deal with who is ‘giving to Republicans’ or who is ‘donating to Democrats’--as both of them claimed. It’s about outside expenditures that may focus on an issue, a piece of legislation, etc--not contributions to a candidate. So while we have a possible explanation for Ms Maddow’s claim, the claim is still false. And that only makes more intriguing the question of how it is that, less than a day after Rachel Maddow spoke, Shep Smith happened to misrepresent this data in exactly the same way. There is a follow-up to this post here.